Concord Seedless grapes are medium to large in size, but are slightly smaller than the seeded concord variety, and are round to oval in shape, growing in loose clusters on sturdy climbing vines. The thick, crisp skin varies in color from deep blue, purple, to almost black and a powdery film, or bloom, also develops on the skin’s surface which provides a natural waterproofing and prevents cracking. Concord Seedless grapes are a slip-skin variety, meaning the skin can be easily removed from the flesh without damaging it. The translucent green flesh is juicy, soft, and almost gelatinous. Concord Seedless grapes are highly aromatic and very sweet with a unique musky flavor. Concord Seedless grapes are available late summer to early fall. Concord Seedless grapes, botanically classified as Vitis labrusca ‘Concord Seedless,’ grow on deciduous vines and are members of the Vitaceae family. Named after their city of origin, Concord, Massachusetts, concord grapes have been a part of American viticulture since 1843 and have wild, native, New England ancestors. Concord Seedless grapes were created from a demand for grapes without seeds and were created after the seeded concord gained in popularity. 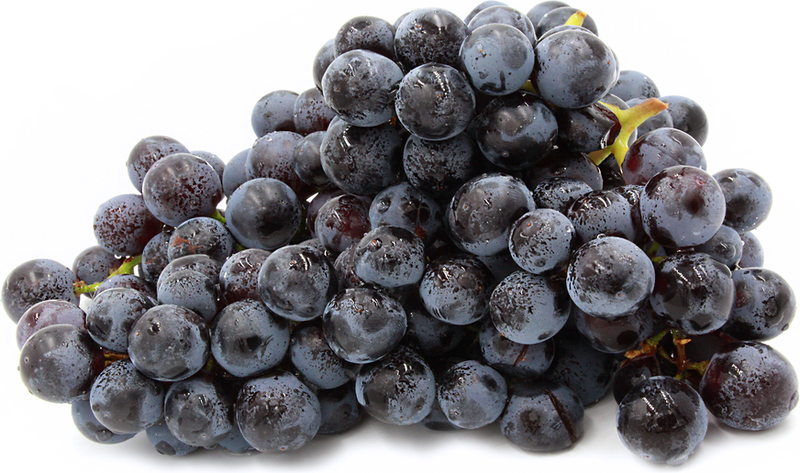 Concord Seedless grapes have a very sweet flavor that is often used in baked goods. This variety is grown on a smaller scale in comparison to the seeded concord because it is unpredictable in regards to the number of seeds that may be present or undetectable, thus not making it ideal for large-scale cultivation. Concord Seedless grapes are an excellent source of vitamin C and the phytonutrient, Resveratrol, an important chemical in maintaining heart health. Concord Seedless grapes are best suited for both raw and cooked applications such as boiling and baking. They can be eaten out of hand and are often referred to as table grapes. Concord Seedless grapes are commonly used for baking pies, scones, muffins, and desserts. It can also be made into preserves, juice, wine, liqueur, and vinegar. The grapes contain a chemical compound known as methyl anthranilate which is used to give soft drinks and candy its grape flavor. Concord Seedless grapes pair well with almond, pistachio, hazelnut, walnut, peanut, lemon, strawberry, raspberry, endive, arugula, fennel, rosemary, mint, yogurt, sour cream, crème fraiche, goat cheese, blue cheese, pork, duck, and poultry. They will keep up to two weeks when stored unwashed in the crisper drawer in the refrigerator. Concord Seedless grapes were created from market demand for grapes without large seeds. Some seedless grapes may have very small, underdeveloped seeds that are undetectable, or they may not contain any trace of seeds altogether. Grape breeders are constantly seeking to improve varieties and respond to consumer preferences to increase profit. Seedless grapes are believed to have been cultivated from cuttings and over time a genetic error occurs in the plants where the seeds no longer develop tough, outer shells. Concord grapes originated in Concord, Massachusetts in 1849 and were first created by Ephraim Wales Bull. Bull wanted to create a hardy vine that could survive the cold climate of Massachusetts. He initially planted 22,000 seedlings and after six years chose one single vine that proved to yield the best fruit, and that original vine is still thriving today in Concord. Seedless varieties were created after the seeded variety became well known. Concord Seedless grapes are still predominately grown in the United States, but the juice and concentrate are also sold in Europe, Asia, and Australia. Recipes that include Concord Seedless Grapes. One is easiest, three is harder. Someone shared Concord Seedless Grapes using the Specialty Produce app for iPhone and Android. 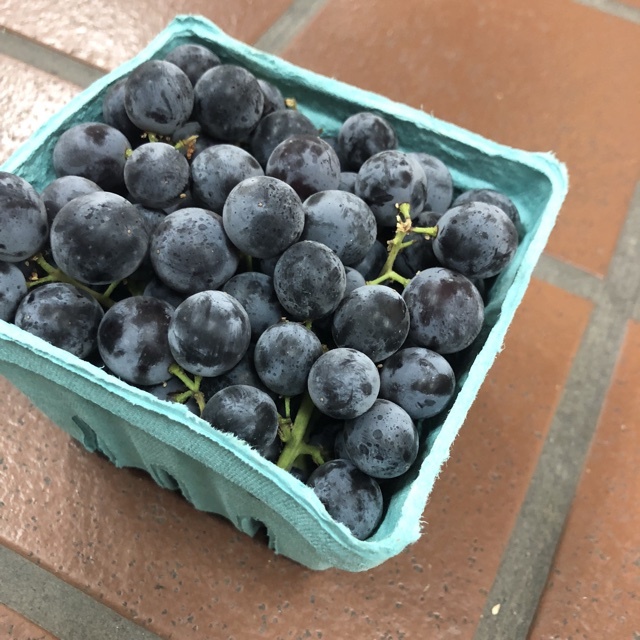 Sharer's comments : Concord Seedless Grapes spotted at Specialty Produce. The flavor of a concord with the convenience of a seedless grape! Grown by Murray Family Farm in Bakersfield, CA.